Ya'qub b. Ishaq al-Kindi was an early Arab scholar of the 9th century, one of the first great scientists that set the stage for the brilliant Islamic tradition of learning. His works in philosophy, cosmology, mathematics, optics, music, cryptology and medicine had a tremendous influence on later centuries. Figure 1: An artistic impression of Al-Kindi (© Muslim Heritage). Al-Kindi General Hospital, one of the biggest medical centres in present day Baghdad was named after the tremendous contributions in medical and pharmaceutical disciplines of the great Arab philosopher al-Kindi. Al-Kindi was best known as a philosopher, but he was also a physician, pharmacist, ophthalmologist, physicist, mathematician, geographer, astronomer, and chemist. "The best man of his time, unique in his knowledge of all the ancient sciences. He is called the Philosopher of the Arabs. His books deal with different sciences, such as logic, philosophy, geometry, arithmetic, astronomy etc. We have connected him with the natural philosophers because of his prominence in Science." Al-Kindi was born in Kufa about 800 CE. His full name is: Abu-Yusuf Ya‘qub ibn Ishaq ibn as-Sabbah ibn ‘Omran ibn Isma‘il al-Kindi. He was the son of the governor of Kufa, an important city in Southern Iraq at that time. He studied first in Kufa and at Baghdad, and won a high reputation at the courts of al-Mam'un (reigned until 833) and al-Mu'tassim (reigned 833–842) as scholar, scientist, and philosopher. He dedicated his most famous work, On First Philosophy, to the Caliph Al-Mu'tassim, who had chosen him as tutor to his son Ahmad . Al-Kindi was a member of the Arab tribe of Kinda, which had played an important role in the early history of Islam. His lineage earned him the title "philosopher of the Arabs" among later writers. He died after 866 CE, and his death date is usually put in the early 870s. Several of his works were translated into Latin, and he is thus also known by the Latinised version of his name, Alkindus . "Our residence in this phenomenal world is transitory; it is a journey towards the eternal one. The most miserable man, is he who prefers for himself the material above the spiritual, for the material, apart from its ephemeral nature, obstructs our passage to the spiritual world. Man should not `disregard any means to protect himself against all human vices, and he should seek to rise to the highest ends of human virtues…, that is, to the knowledge by means of which we protect ourselves against spiritual and bodily disease, and acquire the human virtues in whose very essence goodness is grounded ." Human virtues seem to preoccupy Al-Kindi greatly but without overshadowing the importance and value of divine virtues. The way to worldly happiness, he says, is to reduce to a minimum all external possessions, which cause only sorrow, and the way to other worldly happiness is to know God and to perform those actions, which we know bring us nearer to him . - the diversity of subjects he addressed. 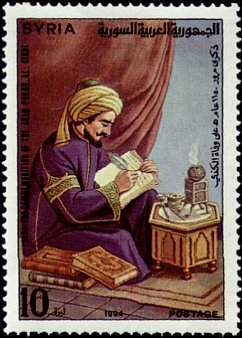 Figure 2: Al-Kindi as depicted in a Syrian post stamp. This first point is crucially important, for one of the major defects of modern history of science in Western hands is to attribute scientific methodology and experimentation solely to Western scholars of the 13th century and after. For instance, Alistair Crombie, an influential historian, tells that experimentation began with Grosseteste . Hundreds of other Western historians speak of experimentation as being born in the Renaissance, late 15th century onwards. And yet, here, remarkably, as outlined by Dunlop, are many instances which show clearly, how Al-Kindi, one of Islam's earliest scholars, preceded those Western experimentalists by centuries . "One can also observe by the senses, how in consequence of extreme cold air changes into water. To do this, one takes a glass bottle, fills it completely with snow, and closes its end carefully. Then one determines its weight by weighing. One places it in a container of very nearly the same size, which has previously been weighed. On the surface of the bottle the air changes into water, and appears upon it like the drops on large porous pitchers, so that a considerable amount of water gradually collects inside the container. One then weighs the bottle, the water and the container, and finds their weight greater than previously which proves the change ." "Some foolish persons are of opinion that the snow exudes through the glass. This is impossible. There is no process by which water or snow can be made to pass through glass." This reads like a modern laboratory experiment, Dunlop observes . Dunlop rightly observes that Al-Kindi is not deterred by the authority of Aristotle and other Greek predecessors, and he applies once more experimentation to prove his theories by applying the test of experiment through instances, which he details in his works, and some of which can be found outlined, or reproduced in great detail by Dunlop. A modern scientist, Dunlop notes, could scarcely be more scrupulous, and he might very well be much more dogmatic about contemporary theory . The examples given show Al-Kindi's recognition of the value of direct observation and his willingness to use experiment, even constructing a special piece of apparatus for the purpose. His ability to invent and apply an appropriate experiment will scarcely be denied . "Anthemius should not have accepted information without proof… He tells how to construct a mirror from which twenty four rays are reflected on a single point, without showing how to establish where the rays unite at a given distance from the middle of the mirror's surface. We, on the other hand, have described this with as much evidence as our ability permits, furnishing what was missing, for he has not mentioned a definite distance ." Al-Kindi, experimental scholar and physicist, appears as a man of the chemical laboratory in Kitab Kimiya' al-'Itr (Book of the Chemistry of Perfume), signalled by Helmut Ritter in an Istanbul manuscript and edited in 948 by Karl Garbers. It contains more than 100 recipes for fragrant oils, salves, aromatic waters and substitutes or imitations of costly drugs. It is a systematic treatment of the subject, occupying almost 60 pages of the printed Arabic text (99 folios in the MS) . Al-Kindi's work in the laboratory is reported by a witness who said: "I received the following description, or recipe, from Abu Yusuf Ya'qub b. Ishaq Al-Kindi, and I saw him making it and giving it an addition in my presence." The writer goes on in the same section to speak of the preparation of a perfume called ghaliya, which contained musk, amber and other ingredients; too long to quote here, but which reveals a long list of technical names of drugs and apparatus . A second recipe for the production of camphor is shorter, and can be found in Dunlop . From these examples, Al-Kindi can be seen occupied with experiments of considerable elaboration to produce synthetic perfumes. That he engaged personally in the drug trade, however, is more than doubtful . The title of one of his lost works is A Treatise on the Artificial Production of Foodstuffs without their Elements, which describes the same kind of experiment with a different range of material. The work was for theoretical purposes, and the experiments might have been made, for example, for the relief of famine . "Ya'qub b. Ishaq b. as-Sabbah Al-Kindi composed a Risala (treatise) on alchemy in two parts, in which he shows the impossibility of man's rivalling the creative power of nature, and exposes the deceptions and artifices of the adepts of this art. This treatise is entitled Refutation of the Claim of Those Who Claim the Artificial Fabrication of Gold and Silver ." The treatise in question comes in the list of Al-Kindi 's works, along with another of similar title and subject, warning against the Deceptions of the Alchemists. Al-Kindi distinguished alchemy, in the sense of exclusive pursuit of transmutation of the baser metals from its more respectable sister chemistry, and, if so, this, considering the time at which he lived, must be regarded as a remarkable achievement . The wide and varied knowledge of Al-Kindi is only matched by his considerable output. The first list of his works that has come to us is by Ibn al-Nadim, already mentioned. Al-Nadim tells of 242 works. Ibn al-Nadim divides them according to their subject matter into philosophy, logic, arithmetic, spherics, astronomy, geometry, cosmology, medicine, psychology, meteorology and so forth . Flugel, on the other hand, has collected and classified the names of 265 works . More or less the same number of works is confirmed by other biographers, such as Ibn al-Qifti and Ibn Abi Usaybi'a. As just touched upon, Al-Kindi addressed a wide variety of subjects. "Like so many thinkers in that confident heyday of the Moslem mind," Durant says, "he was an omnivorous polymath, studying everything, writing 265 treatises about everything –arithmetic, geometry, astronomy, meteorology, geography, physics, politics, music, medicine, philosophy ." He also struggled to reduce health, medicine, and music to mathematical relations, and studied the tides, sought the laws that determine the speed of a falling body, and investigated the phenomena of light in a book on Optics which influenced Roger Bacon . Neither did he omit to write on tides and the determination of specific gravities . He wrote an introduction to arithmetic, eight manuscripts on the theory of numbers, and two measuring proportions and time . Ibn al-Nadim lists in fact 10 titles on arithmetic and 22 on geometry . Al-Kindi was also the first to develop spherical geometry, which he made use of in his astronomical works . He also wrote on spherics, the construction of an azimuth on a sphere, and how to level a sphere . Al-Kindi also lent his particular interest to the laws that govern the fall of a body . He did not ignore subjects of geology, geography, and climatology ; and went still further in his research, undertaking studies with a technological aim as well: the making of clocks; astronomical instruments, and even objects such as swords . Al-Kindi's treatises dealing with ethics and political philosophy include those on Morals, On Facilitating the Paths to the Virtues, On the Warding-off of Grieves, On the Government of the Common People, and Account of the Intellect . Most of such works have survived in Latin rather than in their original Arabic form. One can look at one or two works by Al-Kindi to show his pioneering genius, and also realise how extraordinary was the scope of Muslim science to discuss matters some ten centuries before they were addressed elsewhere. "The dark air above us is visible by there being mingled with it from the light of the earth and the light of the stars a colour midway between darkness and light, which is the blue colour. It is evident then that this colour is not the colour of the sky, but merely something which supervenes upon our sight when light and darkness encounter it, like what supervenes upon our sight when we look from behind a transparent coloured terrestrial body at bright objects, as in the sunrise, for we see them with their own colours mingled with the colours of the transparent object, as we find when we look from behind a piece of glass, for we see what is beyond of a colour between that of the glass and that of the object regarded ." This is at the same time the conclusion of the investigation. It seems that Al-Kindi was here on the right lines, apparently without guidance from outside and in spite of the confused and impossible views which passed for knowledge even in highly educated circles in his time . "Since we wish to complete the mathematics and set forth therein what the ancients have transmitted to us, and increase that which they began and in which there are for us opportunities of attaining all the goods of the soul, it is necessary for us to speak about optics, universally and demonstratively, according to our capacity, and to take the principles of what we say about optics from nature, because the sight by which individual things are comprehended is one of the senses, in order that it may be declared by us how visible things are comprehended. The geometrical principles which will be the principles of our geometrical observations will be second to the natural principles, though first so far as we are concerned, in order that the principles of our demonstrations may not be as it were unnatural relations. Otherwise what we say would be nonsense, departing from the way of demonstration. We ask the reader to whom this book of ours may come, if he finds anything which we have not spoken of sufficiently, to be patient and not hasten to think ill of us, till he has understood truly all the previous treatises about the other parts of mathematics –for this book follows them– and to supply what he thinks we have omitted, according to what the men of his age require. The length may be curtailed or expanded for all men of any time and place, and thus be made more agreeable to their wishes. Our wish is to thank those who have helped us by their advice and who agree with our work, and to help whom we can, according to human utility, and not to seek after praise and… arrogance ." Even after the appearance of a famous treatise on optics by Ibn al-Haytham, the famed Kitab al-Manazir (Optica Thesaurus in Latin) al-Kindi's work held its own authority. It discusses in turn, in 24 chapters, how the light rays come in a straight line, the process of sight without a mirror, the process of sight involving mirrors, and the influence of distance and angle on the sight, together with optical illusions. According to Vogel, "Roger Bacon not merely counted Al-Kindi one of the masters of perspective but in his own Perspectiva and others of his works referred repeatedly to his Optics. The influence of Al-Kindi's work extended to Leonardo da Vinci, and the book was still referred to in the seventeenth century ." Again, worth noting, that in his optical work, Al-Kindi rejects Euclid's theory of emission, amending it to conform to observed data . For instance, he asserts that a visual cone is not formed of discrete rays as Euclid had stated, but appears as a volume of continuous radiations . Rays are three dimensional and form a continuous radiant cone, a critique which prepared the way for Ibn al-Haytham's distinction between light rays and the straight lines along which they are propagated . Figure 4: The well known book of David C. Lindberg on Al-Kindi's optics: Theories of Vision from Al-Kindi to Kepler (University of Chicago Press, 1976). Al-Kindi's works on mathematics were numerous – Flugel in his monograph on Al-Kindi gives more than twenty – and their influence is not to be underestimated . Al-Kindi, as a medical man, addressed amongst the diseases epilepsy, which is well detailed by Dunlop. Al-Kindi states in his introduction: "May God surround you with salvation, and establish you in its paths and aid you to attain the truth and enjoy the fruits thereof! You have asked me –may God direct you to all things profitable!– that I should outline to you the disease called Sar' [the falling-sickness, epilepsy]. The principal cause here is common to several ailments which differ in regard to the parts affected and strength and weakness ." He then proceeds to explain the physiological reasons for the causes of epilepsy. Al-Kindi's influence was lasting on subsequent Western scholars as already briefly noted. His two treatises on geometrical and physiological optics were utilised by Roger Bacon and the German physicist Witelo . 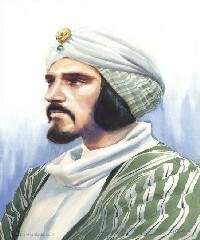 Al-Kindi's influence was so widely felt that Geronimo Cardano (1501-1576), the Italian physician and mathematician, considered him one of the twelve great minds of history . This is no more than might be expected, if we consider the field of interest of the man, which is Cardano, who among the moderns perhaps most nearly resembles Al-Kindi . Al-Kindi was one of the first Arab scholars involved in studying and commenting on Greek scientific and philosophical manuscripts. He defined philosophy as "the establishment of what is true and right". He first wrote treatises in epistemology and logic books such as Risalah fi Hudud al-Ashya' wa Rusumiha (On the Definitions of Things and their Descriptions). His other philosophical works include the famous Rasa'il al-falsafiya (Philosophical Treatises), among which the most influential were: Fi al-falsafa al-ula (On First Philosophy), Fi wahdaniyat Allah wa tunahiy jism al-‘alam (On the Oneness of God and the Limitation of the Body of the World), Fi kammiya kutub Aristutalis wa ma yohtaju ilaihi fi tahsil al-falsafa (The Quantity of Aristotle's Books and What is Required for the Acquisition of Philosophy). Although Al-Kindi was influenced by the work of Aristotle (384-322 BCE), he put the Greek's ideas in a new context and laid the foundations of a new philosophy. He first elaborated a system of thought based on the logic of Greek philosophy, hence developed logic and systematic explanations for some of the debated theological issues of his time, such as creation, immortality, God's knowledge, and prophecy. In his point of view, the philosophical sciences could be divided into mathematics, physics and theology. Interestingly, one of his philosophical theorems has been proved mathematically. In his eleven arithmetic works, Al-Kindi wrote on Indian numbers, the harmony of numbers, lines and multiplication with numbers, relative quantities, measuring proportion and time, and numerical procedures and cancellation. In geometry, he commented on the theory of parallels. He gave a lemma investigating the possibility of exhibiting pairs of lines in the plane, which are simultaneously non-parallel and non-intersecting. He also made rich contributions to the Arabic system of numerals, which was largely developed by Al-Khwarizmi. Recently, his book on Cryptology and the application of mathematics to decipher encrypted language become famous through the publication of "The Code Book" by Dr. Simon Singh (see ref.7; other references to this may be found in refs. 8-11). Al-Kindi also delved in medicine. He produced twenty two publications on medical topics. One of his major contributions in medicine and pharmaceutics was to determine and apply a correct dosage, which formed the bases of medical formulary. His writings, most of which were short treatises, are classified into seventeen groups; Philosophy, Logic, Arithmetics, Globe, Music, Astronomy, Geometry, Sphere, Medicine, Astrology, Dialectic, Psychology, Politics, Meteorology, Dimensions, First things and Metals, Chemicals Several of his books were translated into Latin and was known as Al-Kindus. His thoughts very much influenced medieval Europe. According to historical records, al-Kindi had been subject to jealousies from rivals especially during the era of Caliph al-Mutawakkil (841-861) when he had the most difficult time of his life due to a conspiracy against him. He died in Baghdad in c. 873. "How is it that you are never seen asking at the door of the sultan, or at the gatherings of businessmen?" "These are places where the likes of you seek their fortunes, I seek mine there where nobody ever dreams of taking it away from me ." Abboud, Tony, Al-Kindi: The Father of Arab Philosophy, New York: The Rosen Pub. Group, 2006. Badawi, Abderahman, Rasa'il falsafiya li-l-Kindi wa-'l-Farabi wa-Ibn ?Addi wa-Ibn Bajja, Beirut: Dar al-Andalus, 1980. Bin Yusoff, Yaacob 1985. The Classification of Sciences in Islamic Thought: al-Kindi-Ibn Rushd (800-1200 A.D./200-600 A.H.) Thesis submitted in fulfilment of the requirements for the Degree of Master of Arts. Birmingham, West Midlands: University of Birmingham. Burnett, Charles 1993. "Al-Kindi on Judicial Astrology: The Forty Chapters." AS&P vol. 2: pp. 237-298. Burnett, Charles, Scientific Weather Forecasting in the Middle Ages: The Writings of Al-Kindi. London: Kegan Paul, 1997. Celentano, Guiseppe 1979. Due scritti medici di al-Kindi. Napoli: Istituto orientale di Napoli. Endress, G., "The Circle of al-Kindi: Early Arabic Translations from the Greek and the Rise of Islamic Philosophy". In: Endress, G., & Kruk, Remke (eds. ), The Ancient Tradition in Christian and Islamic Hellenism: Studies on the Transmission of Greek Philosophy and Sciences Dedicated to H.J. Drossaart Lulofs on his 90th Birthday. Leiden: Research School of Asian, African, and Amerindian Studies, 1997, pp. 43-76. Gutas, Dimitri, "Geometry and the Rebirth of Philosophy in Arabic with al-Kindi." In: Words, Texts and Concepts Cruising the Mediterranean Sea. Edited by R. Arnzen and J. Thielmann. Louvain/Paris: Peeters, 2004, pp. 195-209. Ibraham A. "Al-Kindi: The origins of cryptology: The Arab contributions", Cryptologia, vol.16, no 2 (April 1992) pp. 97-126. Ivry, Alfred L. 1974. Al-Kindi's Metaphysics (Falsafah al-ula: On First Philosophy). Albany: State University of New York Press. Kennedy-Day, K. (No date). al-Kindi, Abu Yusuf Ya‘qub ibn Ishaq (d. c.866–73). http://www.muslimphilosophy.com/ip/kin.htm. 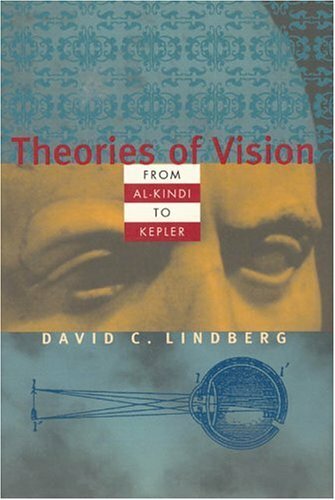 Lindberg, David C., Theories of Vision from Al-Kindi to Kepler. Chicago/London: Chicago University Press, paperback 1976. O'Connor, J.J. & Robertson, E.F.(1999). "Abu Yusuf Yaqub ibn Ishaq al-Sabbah Al-Kindi: http://www-gap.dcs.st-and.ac.uk/~history/Biographies/Al-Kindi.html. Rashed, Roshdi, "Al-Kindis Commentary on Archimedes' The Measurement of the Circle." Arabic Science and Philosophy vol. 3(1993): pp. 7-53. R. Rashed and J. Jolivet: Œuvres philosophiques et scientifiques d'al-Kindi. 2 vols. : L'Optique et la Catoptrique - Métaphysique et Cosmologie. Leiden: Brill, 1997-1998. Arabic translation of vol. 1: Beirut, 2003. Shalhub, Sami, "Nazariyat al-ibsar ?inda al-Kindi", Majallat buhuth Jami'at Halab, vol. 26: pp. 199-221. Singh, Simon, The Code Book: The Secret History of Codes and Code-Breaking, 1999. J. Jolivet and R. Rashed, "Al-Kindi", Dictionary of Scientific Biography, editor in chief Charles Coulston Gillispie, New York: Charles Scribner's Sons, 1973-, vol. 15, Supplement I, pp. 261-66; p. 261. A detailed bio-bibliography of al-Kindi can be found in Peter Adamson, "Al-Kindi", The Stanford Encyclopedia of Philosophy (Winter 2006, online edition). URL: Edward N. Zalta (ed. ): http://plato.stanford.edu/archives/win2006/entries/al-kindi. Rasa'il al-Kindi al-falsafiya, i. 280; in G.N. Atiyeh, Al-Kindi, Rawalpindi: Islamic Research Institute, 1966, p. 127. Al-Muntakhab, fol 65a; in G.N. Atiyeh, Al-Kindi, p. 127. A.C Crombie, Robert Grossesteste and the Origins of the Experimental Science, Oxford, 1953. D.M. Dunlop, Arab Civilisation 800-1500 A.D, Longman Group Ltd, 1971., pp 223 ff. Kitab al-Kindi fi al-shu'a'at, in J. Jolivet and R. Rashed, "Al-Kindi", op. cit., p. 264. D.M. Dunlop, Arab civilization, op. cit., p. 229. Ibn Al-Nadim, The Fihrist of Ibn al-Nadim, edited and translated by Bayard Dodge, New York: Columbia University Press, 1970, pp. 615-26. V.G. Flugel, "Al-Kindi gennant des philosoph der Araber", in Abhandlunges, I,2, Leipzig, 1858. W. Durant, The Age of Faith, New York: Simon and Shuster, 6th printing; 1950. E. Dijksterhuis, The Mechanisation of the World Picture, trans C. Dikshoorn, Oxford: Clarendon Press, 1961, p. 111. P.K. Hitti, History of the Arabs, London: MacMillan, 1970, p. 370. Ibn al-Nadim, Al-Fihrist; op. cit., pp. 617-79. P. K. Hitti, History, op. cit., p. 370. Carra de Vaux, "Astronomy and Mathematics", in T. Arnold and A. Guillaume ed., The Legacy of Islam, first edition, Oxford University Press, 1931, p. 391. J. Jolivet and R. Rashed, "Al-Kindi", op. cit., p. 265. Robert Hoyland and Brian Gilmour, Medieval Islamic Swords and Swordmaking: Kindi's Treatise 'On Swords and Their Kinds' . Edition, Translation, and Commentary. Warminster: Gibb Memorial Trust, 2006. This work was commissioned by the Abbasid caliph Al-Mu'tasim, and the content of the treatise presumably reflects the ruler's general interest in his army and its equipment, and his specific interest in the technical aspects of sword production. In this work, Kindi discusses the difference between iron and steel, distinguishes different qualities of sword blade, and different centres of swordsmithing. He refers to the Indian Ocean trade in steel ingots and to the distinctive character of European swords of the period. He includes technical terms used by the makers, and distinguishes swords by their physical features - form, measurements, weight, watered pattern, sculptured details, or inlaid ornaments. E. A. Myers, Arabic Thought and the Western World, New York: Frederick Ungar Publishing, 1964, p. 11. In the Journal of the Royal Asiatic Society of Bombay, vol. 13 (1937), pp. 7-19. D.M. Dunlop, Arab Civilization, op. cit., pp. 226-27. J. Jolivet and R. Rashed, "Al-Kindi", op. cit., p. 263. D.M. Dunlop, Arab Civilization, p. 228. E. A. Myers, Arabic Thought, op. cit., p. 11. D.M. Dunlop, Arab Civilization, p. 233. Quoted by G.N. Atiyeh in Al-Kindi, op. cit, p. 9.